Not to be confused with Joan Cusack. This article is about the actor. For other people named John Cusack, see John Cusack (disambiguation). John Paul Cusack (/ˈkjuːsæk/; born June 28, 1966) is an American actor, producer and screenwriter. He began acting in films during the 1980s and has since starred in a number of movies, including Better Off Dead (1985), Say Anything... (1989), Grosse Pointe Blank (1997), Being John Malkovich (1999), High Fidelity (2000), 1408 (2007), Igor (2008), 2012 (2009) and The Raven (2012). 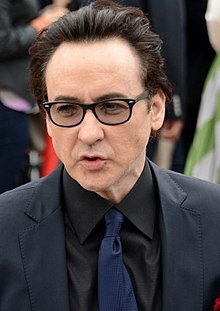 Cusack was born on June 28, 1966, at St. Joseph Hospital in Chicago's Lakeview neighborhood and grew up in Evanston, Illinois. He was born into an Irish Catholic family and fourth of five children. His mother, Ann Paula "Nancy" (née Carolan), is a former mathematics teacher and political activist. His father, Richard Cusack (1925–2003), was an actor, along with John's siblings Ann, Joan, Bill, and Susie. They moved from Manhattan, New York, to Illinois. Richard was also a documentary filmmaker who owned a film production company and was a friend of activist Philip Berrigan. Cusack graduated from Evanston Township High School in 1984, where he met Jeremy Piven, and spent a year at New York University before dropping out, saying that he had "too much fire in his belly". Cusack began acting in films in the early 1980s. He made his breakout role in Rob Reiner's The Sure Thing (1985). He also starred in Cameron Crowe's directorial debut film, Say Anything... (1989). Cusack played a con artist in Stephen Frears' 1990 neo-noir film The Grifters. After establishing New Crime Productions, Cusack co-wrote the screenplay for and starred in George Armitage's crime film Grosse Pointe Blank (1997), in which he played an assassin who goes to his 10-year high school reunion to win back his high school sweetheart. In Spike Jonze's fantasy film Being John Malkovich (1999), Cusack played a puppeteer who finds a portal leading into the mind of the eponymous actor, John Malkovich. The film was nominated for three Academy Awards, including Best Director (Jonze), Best Original Screenplay (Charlie Kaufman) and Best Supporting Actress (Catherine Keener). Cusack was nominated for a Golden Globe Award for Best Actor – Motion Picture Musical or Comedy for his performance in High Fidelity (2000), based on Nick Hornby's novel. In Roland Emmerich's disaster film 2012 (2009), he played a struggling novelist who attempts to survive the apocalypse and save mankind. Cusack played Edgar Allan Poe in James McTeigue's biopic film The Raven (2012) and starred in David Cronenberg's Maps to the Stars (2014). Later, he starred in video on demand films, including The Factory, The Numbers Station, The Frozen Ground, Drive Hard (2014), The Prince (2014), Reclaim (2014), Cell (2016), Arsenal (2017), Blood Money (2017) and Singularity (2017). Between 2005 and 2009, Cusack wrote blogs for The Huffington Post, which included an interview with Naomi Klein. He blogged on his opposition to the war in Iraq and his hatred for the Bush administration, calling its worldview "depressing, corrupt, unlawful, and tragically absurd". He also appeared in a June 2008 MoveOn.org advertisement, where he made the claim that George W. Bush and John McCain have the same governing priorities. Cusack criticized the Obama administration for its drone policy in the Middle East and its support of the National Defense Authorization Act, and became one of the initial supporters of the Freedom of the Press Foundation in 2012. In June 2015, he stated in an interview with The Daily Beast that "when you talk about drones, the American Empire, the NSA, civil liberties, attacks on journalism and whistleblowers, (Obama) is as bad or worse than Bush". However, he later scolded the publication for misquoting him in order to make an interesting headline. In 2015, Cusack, Daniel Ellsberg and Arundhati Roy met Edward Snowden, a fugitive from the US because of his leaks of classified information, at a Moscow hotel room. This meeting was converted into a book co-authored with Roy titled Things That Can and Cannot Be Said. The book is mainly a transcript of the conversation between Snowden, Roy, and Cusack, with a selection of relevant photos and illustrations as well as a detailed list of references. Cusack endorsed Senator Bernie Sanders in his 2016 and 2020 presidential bids. In November 2017, Cusack became a member of the Democratic Socialists of America. Cusack is a fan of both the Chicago Cubs and the Chicago White Sox, for which he says he is "in trouble" in Chicago due to the longstanding rivalry between the teams. He led the crowd in a performance of "Take Me Out to the Ball Game" at Wrigley Field. He was in attendance—along with fellow Cubs fans Bill Murray, Eddie Vedder and Bonnie Hunt—during the Cubs' historic Game Seven victory during the 2016 World Series. Cusack appeared at multiple Chicago Bears games and attended many Stanley Cup Finals games in support of the Chicago Blackhawks. Cusack once told NBC Nightly News, "I'm not lazy. I just enjoy gradually waking up in the morning. If that means sleeping in and walking around the house in my crocs and a bathrobe 'til three in the afternoon, I welcome that appealing lifestyle—all day." He trained in kickboxing under former world kickboxing champion Benny Urquidez for over two decades. He began training under Urquidez in preparation for his role in Say Anything... and holds the rank of a level six black belt in Urquidez's Ukidokan Kickboxing system. In March 2008, police arrested Emily Leatherman outside Cusack's Malibu, California, home for stalking him. On October 10, 2008, Leatherman pleaded no contest and received five years' probation and mandatory psychiatric counseling, and was ordered to stay away from Cusack, his home, and business for the next ten years. He is well known for being a bachelor. When asked in 2009 why he had never married he answered, "society doesn't tell me what to do." 1996 Frasier Greg Voice; Episode: "Our Father Whose Art Ain't Heaven"
2014 Doll & Em John Episode: "Three"
^ "John Cusack interview". Iofilm.co.uk. Retrieved 27 November 2017. ^ "John Cusack Interview-Max Movie". About.com Hollywood Movies. Retrieved 7 June 2015. ^ raidmasterlive.com Biography. "John Cusack Biography". raidmasterlive.com. Raid Master Live Entertainment. Retrieved April 18, 2019. ^ "Cusack, Richard J." Chicago Tribune. 2003-06-03. Retrieved 2010-08-27. ^ "Miss Carolan, Newton Centre, Is Bride of Richard Cusack". Daily Boston Globe. February 14, 1960. ^ "Newton Girl Plans February Wedding". Daily Boston Globe. December 6, 1959. ^ "Actor John johan on Hitler, politics and his movie 'Max'." Beliefnet.com. ^ Johnson, Grace (May 12, 2009). "ETHS boasts celebrity graduates". The Daily Northwestern. Retrieved November 7, 2014. ^ Duthel, C. (2012). Angelina Jolie - The Lightning Star. p. 323. ISBN 978-1-4710-8935-0. ^ "Julianne Moore, John Cusack, Sarah Gadon Join Robert Pattinson and in Maps to the Stars". Retrieved 20 July 2013. ^ John Cusack - Politics on The Huffington Post. ^ "John Cusack Stars In MoveOn's New McCain Ad". Huffington Post. Associated Press. June 11, 2008. ^ "John Cusack Talks 'Love & Mercy,' Drug Trips, and the Ways Obama Is 'Worse Than Bush'". The Daily Beast. Retrieved 7 June 2015. ^ "John Cusack on Twitter". Twitter. Retrieved 7 June 2015. ^ Roy, Arundhati (28 November 2015). "Edward Snowden meets Arundhati Roy and John Cusack: 'He was small and lithe, like a house cat'". The Guardian. Retrieved 30 November 2015. ^ "Things That Can and Cannot Be Said". Penguin Books. 5 October 2016. ^ John Cusack [@johncusack] (25 Aug 2015). "Why I Endorse Bernie Sanders" (Tweet) – via Twitter. ^ Cusack, John [@johncusack] (February 19, 2019). "Join @OurRevolution Bernie wants 1 mill people in every state committed to changing America" (Tweet). Retrieved February 20, 2019 – via Twitter. ^ @johncusack (7 November 2017). "What you mean join ;)" (Tweet) – via Twitter. ^ Ukidokan Black Belts and Levels Archived 2010-03-12 at the Wayback Machine. URL accessed on March 19, 2010. ^ Andrew Goldman, "Being John Cusack", Elle magazine, November 23, 2009. URL accessed on January 20, 2018. Wikimedia Commons has media related to John Cusack.